Trying to clean your windows by yourself is getting old, isn’t it? No matter how much you try to keep your windows clean and clear, it just won’t keep its shine. And the bigger problem? You don’t have much time to deal with it. Well, why bother? You can have professional home cleaning services for a cheap price and excellent service. From window cleaning services to carpet steam cleaning services our maids can do them for you! Maid in Perth cleaners takes pride in their work. Their main goal is to leave your home clean from top to bottom whilst securing that your property is in good hands. And in the event that their work doesn’t please you, no worries mate! They will come back for no charge and fix it. But not just that, our professional window cleaners can get your window cleaning done in no time. Check out some more perks in getting our services! Regardless if you’re selling or not, it’s still worthwhile to keep your home look good. It doesn’t matter though if you are simply trying to impress neighbours. After all, there is no replacing that satisfying feeling of driving over and seeing your home clean. And of course, the windows flawless. Window cleaning services can help turn your dirty windows shine once again. Furthermore, having it cleaned is a worthwhile investment. Above all, this greatly applies if you’re an entrepreneur that invite business partners in your home. The cleanliness of your place will reflect highly on you as a person. Thus, leaving a good impression on each and every visitor. Dust and dirt if not cleaned will do a lot of damage to the windows. It will turn your windows from flawless clear to edgy rough. And the worse part is that this effect is more likely irreversible. Thus, eventually leading to distortion. And as a result, will make you feel the need to have them replaced. Hence, it would be better to hire someone to maintain it to keep dust and dirt away. The best part of a home is its vibe. It’s familiar aura that only owners can feel. This is a quality far better than size, looks and cost. You can never call a place a home unless it connects with you in a spiritual way. Letting you feel that your very own personality is imprinted on every corner of it. And the windows are one of the main parts of the home that provides this magic. Now, when your windows are not kept very well, you might somehow lose that vibe that you most enjoy whenever you are at home. Ergo, it’s always better to keep them clean. Let the professionals do their job. They can keep your windows clean and hygienic. Cleaning your own windows by yourself will require you to provide your own resources. Hence, the tendency is that you will have to use tools and a ladder that does not really pass the standards of safety. Unlike if you hire a window cleaner, cleaning the windows will not be just as dangerous. Plus, you can rest assured that the right methodologies are being used. DIY techniques and innovations do have their own share of usefulness. But they are only handy at some point and on special cases. 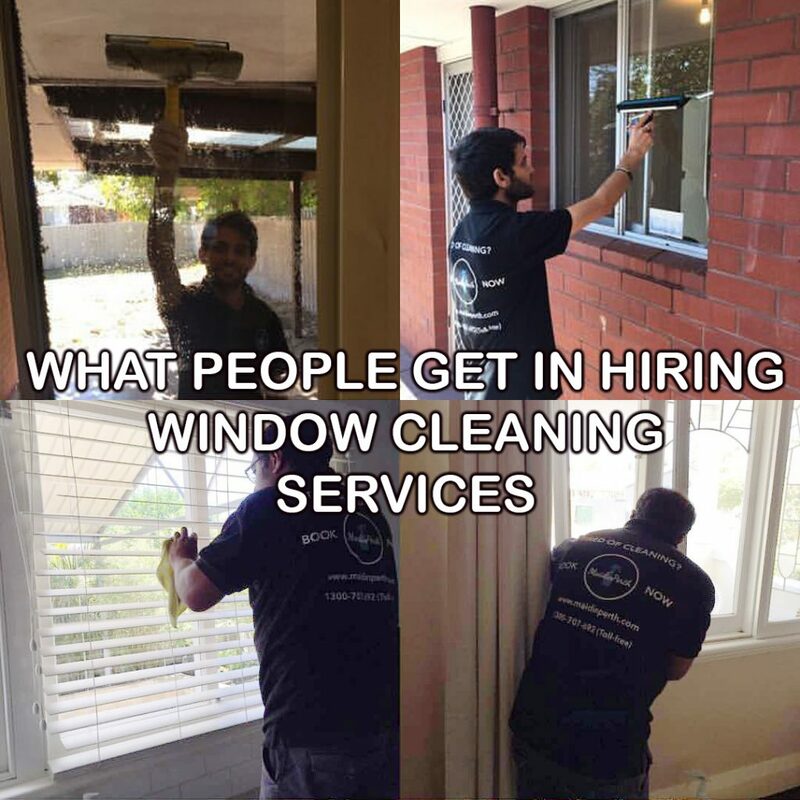 Although in general, window cleaning services will still be your better alternative. Eventually, as you encounter more and more unforeseen contingencies, it will get old on you. And you’d still end up hiring professional cleaners. After all, if you’ll really do the math, you will discover that it wouldn’t really matter much. Especially if you are only concern about your budget. So, take advantage of our services today. If you need more house cleaning services we can certainly offer more! Plus, we can guarantee top of the line competency. Since we hire our maids ourselves, we can guarantee you’re getting only the best service. In fact, all of our maids passed certifications that guarantee their competency. Explore more cleaning services now? Then, by all means, explore the website. You will get more information, especially in our blog section. On our blog page, you will be getting new innovations and techniques in cleaning. Also, read Oven Cleaning Tips. This entry was posted in Home Cleaning and tagged cleaning services, house cleaning services, Maid in Perth, window cleaning.